What Is Animal Law? by Jerrold Tannenbaum, M.A., J.D., published in theCleveland State Law Review, is now available for download. This is a must-read for anybody who wants to understand the complex and often-confusing issue of animal law, and covers the importance of how it defines itself. Click here to read the latest issue of ShowSight and browse back issues. We have been duped. Dog breeders have been used by the Animal Activists in their war on domestic pets. About 25 years ago a small core of Animal Activists who are now in control of all the major national animal rights organizations forged a plan, and we unwittingly helped them out. They started a campaign to close down all pet stores that had live animals in them, knowing full well that the demand for the puppies in these facilities would remain high. Dog breeders helped them. We railed against the nasty pet stores and their supplies of unworthy dogs. We offered up our own well-bred puppies as alternatives, even though we could never meet the demand the public has for puppies. We thought we were taking the high road, and embraced the new animal rights-leaning shelters that wanted to shut down the pet stores. We even put statements into our “codes of ethics” that said we would never allow our puppies to be sold in a pet store. We felt holy. So where does the public go to buy their puppies now? Pet ownership is at an all-time high, and many of us hobby breeders still have trouble selling our pure bred puppies for what they are actually worth. I’ll tell you where the public is getting their pets from. They are now going to the retail shelters and rescues to find their pets. The small, local breeders that supplied local pet stores are being replaced by commercial kennels far away and invisible. The poorly operated puppy farms are still breeding dogs, they have merely gone further underground. The transportation of puppies from huge kennels and shelters in the south and from places outside this country has ballooned into a multi-million dollar mega-business. Now here’s the real kicker. Most of these retailers of puppies now claim non-profit status. They don’t pay taxes to support their communities any more. They slap the title “rescue” onto what they are doing, and suddenly they are self-righteous saviors of poor mistreated animals rather than brokers and transporters of poorly manufactured products specifically bred to produce a profit. And the public who is “rescuing” these dogs feels holy. Follow the money. If you ever need to know why something is happening the way it is, and your common sense is telling you the logical signs just don’t add up, follow the money. By shifting the sales of pets from regulated, independent, tax-paying businesses to largely clandestine, non-profit suppliers the animal activists have brilliantly co-opted the very enemy we thought we were fighting against. Realistically all shelters should have been working to put themselves out of business – not the pet stores. They should have done such good work educating the public how to be responsible dog owners that over time there would no longer be a critical need for their services. Obviously that didn’t happen. Here in Wisconsin we recently built a $6.5 million facility that has to have semi-loads of dogs shipped in regularly to keep it stocked. And they can turn-around (sell the entire inventory)their product in about 48 hours. That certainly makes them enough cash to keep the doors open and the lights on. And they don’t pay taxes. How about this overwhelming push to spay and neuter all dogs? Wow! What a money maker that has become! Now a local individual or their neighbors and friends cannot morally create their own pets because it is unethical to keep their dogs intact. They have to go back to the retail shelter stores to purchase another one. The animal activists have even co-opted the veterinary community into believing that all pets should be spayed and neutered, when, in fact, there is no clinical evidence to support that this is best for every animal. Just now some studies are coming out that say, in fact, the opposite is true. I don’t know why the veterinary community has allowed themselves to be so coopted, unless I follow the money. As my own vet points out, she would be out of business tomorrow if all of the mixed breeds were as healthy as people claim they are. Common sense should be telling us the same thing. If heterogeneity was the answer to perfect health, then humans would be the healthiest species on the face of the planet. And we are not. Genetics work pretty much the same across species. Does anyone think outside the propaganda anymore? I ask people regularly when they last saw a stray dog in their neighborhood. In northern states it is rare. If a dog is found loose, more often than not, it is a runaway not a stray. Most of the dogs in shelters are surrenders, not strays. And who is surrendering those dogs? Could it be the same population of people who wanted to rescue the ill-tempered, unhealthy puppies they saw in shelters? Everyone wants to be a savior – until it gets expensive, dangerous or just too hard. Then they return the untrained, older dog that now has even more serious issues to a shelter that re-sells it to someone else. When I get a puppy back as an older dog, I usually place the dog in a new home for nothing. And I have to spend time and advertising money screening the new potential owners. The revolving door of sell, surrender, re-sell can become quite profitable if a shelter gets the same amount of money each time they sell the same dog. This is how far out-of-whack things have gotten in this country. Some time ago I was nominated by a member in one of my national breed clubs to receive a breeder of the year award. The person who actually won the award is a fine breeder in the UK and she does a great job with her dogs. But the primary reason I was eliminated as a contender for the breeder of the year award was because I do not support “rescue,” and had actually written articles about what mixed-breed rescue has become in this country. Silly me. I thought the award was about being a breeder. My dogs don’t go into rescue programs because I take them back or rehome them if at any point in their lives they cannot be kept by their owners. I have started a non-profit, Keep Your Pets, Inc, dedicated to keeping families in crisis together with their pets, but that is not good enough. Apparently it is now not even politically correct for breeders to disparage the concept of rescue as it has evolved in this country. I don’t rescue dogs; I breed and sell them, and sometimes rehome them. And there is nothing wrong with that model. I am a business owner in a Capitalist, free-market economy. My primary business is boarding and grooming pets, but I also sell well-bred puppies. And I spend a lot of money to produce and market those puppies. I don’t get any tax breaks. I don’t get free dog food or free veterinary care. I don’t ask for my supplies to be donated, I purchase them from local vendors. It’s a good model, and it works for all products, not just automobiles and refrigerators. We get so caught up in the “give a puppy a good home” sob stories that we forget that our dogs are a product, too. I adore my dogs. My children often said I loved the dogs more than I loved them (totally untrue). But it does take a lot of time, wisdom and money to produce healthy, well-socialized purebred puppies. We should not feel guilty about wanting to be compensated for the time it takes us to produce a superior product. By refusing to use the language of commerce to talk about pets, we have somehow placed them in a different logical spot in our brain. The current suppliers and sellers of puppies are not fooled. They are very clear about the economics of producing, transporting and selling millions of poorly bred and cheaply produced dogs to unwitting customers for a lot of money. They use the language of adoption and rescue, but they follow the economics of a free enterprise, Capitalist system. They may call themselves “non-profit”, but they are making millions of dollars from the distribution and sales of these puppies. Only we hobby breeders have been foolish enough to let our emotional ties to our dogs get in the way of understanding this economic model. It’s all about supply and demand – and ultimately the demise of domestic pet ownership. Now that shelters and rescues are the last retail places to produce and sell pets, how easy will it be for them to suddenly “expose” the source of all their dogs as nasty puppy farms. Is it too far a stretch to then imagine that they will try to manipulate the emotions they have already sensitized to simply quit demanding these miserable creatures? How better to put someone out of business than to quit demanding their product? Right now, in the animal activist world, it is immoral to own a well-bred purebred, or an unspayed or unneutered dog. If the next step is to say it is immoral to own a dog produced by a puppy farm, they are dangerously close to making all pet ownership immoral. If you don’t think this is the real agenda, then you just are not paying attention. Personally, I don’t think people will allow themselves to be so completely manipulated by these animal activist evangelists. The general public still loves to own a dog even if they now prefer to call it an adoption. But 15 years ago I would not have foreseen a population that preferred to “rescue” a dog rather than buy one from a good breeder if they could afford it. I also did not see the demise of the local for-profit retail pet stores being replaced by non-profit retail shelters. That change happened much faster than I thought it could. Where have all the retail pet stores gone? We helped to put them out of business, never stopping to realize that we were the next targets in a well-planned campaign to end all pet ownership. It’s time for dog breeders to become activists in support of all people who want to legally breed and work with animals. The activists are picking us off one group at a time. Yesterday the pet stores and circuses, today the Carriage Horses and pig farms, tomorrow the hobby breeders, and the day after that, all breeders of all animals. It’s time to choose sides and get active. There is more to aspire to than the next purple ribbon – a way of life is at stake. Reading the positive and affirming comments about NYC carriage horses by equine veterinarians onsavenyccarriagehorses.com for me reinforces the disingenuousness of those who would seek to end a 150+ year-old, beloved NYC tradition. A native New Yorker, I know well the constant renewal that NYC embraces, as neighborhoods fade, then rise again with successive waves of immigrants and the ever-changing nature of our industry and economy. Still, New Yorkers jealously guard those traditions and practices, which are and remain quintessentially New York, and our carriage horse tradition is exactly of that sort. The human partnership with working animals runs long and deep and the carriage horse remains a touchstone to that past, allowing us to remember a simpler time, when that very partnership was essential to life itself. We many are grateful that there remain pockets of animal stewardship that allow us to remember and embrace what has come before. 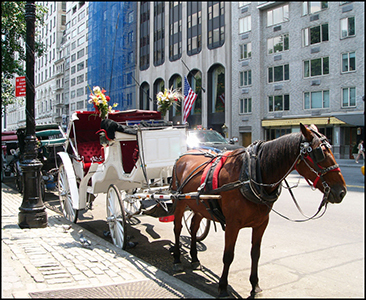 How fortunate we are in NYC to still have carriage horses to remind us of those traditions. Expert equine veterinarians have already made clear the excellent care and husbandry NYC carriage horses receive and there is little need for me to repeat their wisdom. I do want to point out however, the cynical way in which the claims to the contrary are being used to further both real estate investment opportunities for a few, as well as fundraising and publicity for activist organizations bent on their Luddite vision of the place of animals in human societies. The activist organizations of which I speak, NYCLASS, ASPCA, HSUS and others, are not novices in their attempts to ban all manner of traditional uses of animals by human beings, terming them as cruel, neglectful and unnecessary. Faced with objective criteria demonstrating the complete lack of alleged cruelty or neglect, they fall back on unnecessary as though opinion is enough to end the debate. There is an obvious difference between those who profess to care about animals and those few who actually care for them. Those who care for them have real skin in the game, know far more about animal husbandry and have much more invested personally than those who simply write articles, lobby, file lawsuits or raise funds from comfortable offices in Washington DC or on East 92nd Street. As said by former New York Senator, the late Daniel Patrick Moynihan, “Everyone is entitled to his own opinion, but not to his own facts.” The opponents of carriage horses ought to be reminded of that in their pursuit of an ideology that does not include animals in most of their existing mainstream roles in American society. Thankfully such people are in the minority and with effort and some luck, will stay that way.